Like many of you, I wear multiple hats: marketer, content creator, videographer, television host, commentator on ESPN (Yep, really, while broadcasting UF’s swimming and diving! ), customer service rep, website designer, and the list could go on and on. But of all the challenges I deal with daily, time is by far my biggest enemy. Can you relate? This is why I am excited about my newest project, which I am creating specifically for marketing/PR reps and small business owners. This project will allow me to work more efficiently while still being able to help others. I’ve always been excited to share the knowledge I have amassed, both by trial and error with my swim sites as well as what I have gained from other influencers demonstrating their best practices. Sharing with others always turns into a win-win. If I can teach you something I have learned, a pitfall to avoid, or a new shortcut, I usually find I have also learned something from you in return. This open sharing is a key element of my new project. The road to success is wide enough to accommodate us all! This open sharing is also the foundation of FLBlogCon and remains our the stated philosophy today. So in the spirit of open sharing, I am reposting one of my most popular posts on working with online influencers. It goes along with that question, “How do I get bloggers to write about me?” I wrote it probably a year ago and it is a “how-to” on hosting a promotional dinner for bloggers. While this post is specific to restaurants, the principles stand for just about any industry that runs an in-person promotion. Want to get bloggers to write about you? Want influencers to tweet, Instagram, or Snap about you? Here’s a good guide to start planning. As an influencer who used to cover lots of local events for the Central Florida Top 5, I receive my fair share of invitations to dine at restaurants as part of their blogger outreach. Some restaurants do an excellent job of reaching out and hosting, while others don’t quite grasp quite the right way to connect with us. 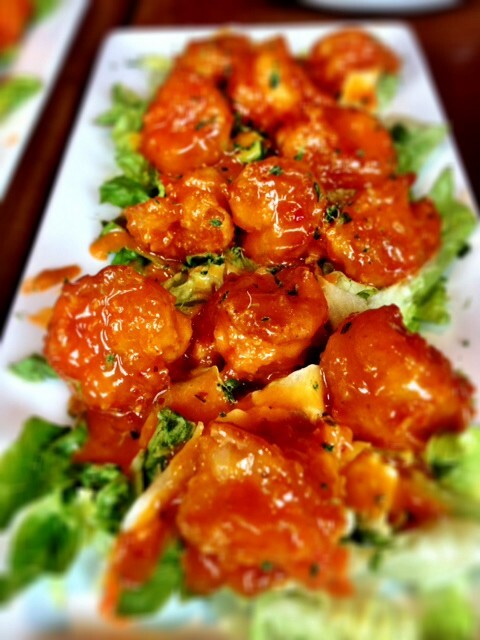 Last week I dined at Red Lobster — all the way out in Clermont (30 miles away!) — as part of a blogger outreach campaign. And, as I was chomping away on the yummy food, I wondered why all restaurants didn’t do such a great job of courting bloggers… thus I wrote this blog post to show what they did right. Linda Costa Communications Group, who was helping with this blogger initiative, has done a consistent job of reaching out and connecting with me as an influencer over the years. Not only have they shown an interest in my professional blogging projects, but they have also reached out personally on my social media channels — Facebook, Twitter, and Instagram. They’ve made comments about my new Great Dane puppy, trips I take, etc., so I feel like a real person who matters to them. They do not just hit me up when they have an event they want me to blog about — this is important! Linda Costa Communications’ Jenni Izzo contacted me via Facebook messages to be sure I saw the general invitation emailed tome about the Red Lobster event and to personally ask me to attend. Just like any party where a friend asks you directly, I felt a bit more obligated to respond. Compare this to only a general mass email where it is easy for me to ignore. Turns out I was even willing to drive out Clermont due to the relationship that Jenni had established — good strategy! Far too many events only allow me, the blogger, into them. Everyone I know hates this! I feel awkward going places alone and I am not too keen on small talk with new people. It is much more inside my comfort zone to be able to bring my husband or a friend. If you are going to host a blogger event, make it something we actually want to attend! It’s one thing for the owners or marketers of a restaurant to set up the blog night, but it’s another to be sure the on-site staff are also on-board and ready! I’ve had an event where the communication broke down and when I arrived, neither the hostess nor waiter knew anything about a special blogging event — yikes! Awkward and embarrassing for me and a real turn off! Well, the Red Lobster hostess not only knew about the event, she was expecting me and knew right where to direct me. The wait staff was friendly and welcoming as was the restaurant’s General Manager. Did I mention this Red Lobster was a 30-mile drive for me? 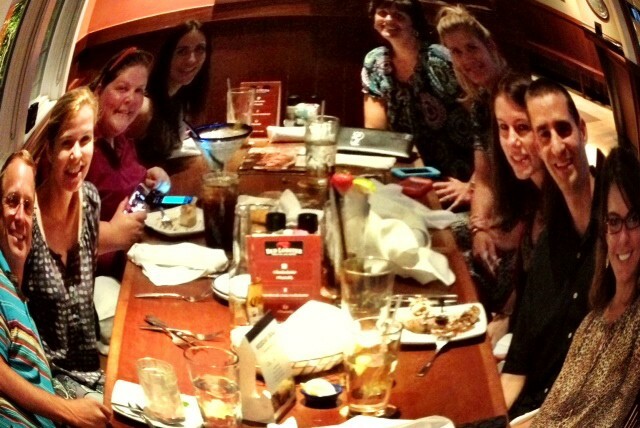 And I think most of the other bloggers who came were also from the Orlando area. (How many bloggers could Clermont realistically have?) So, if we make the drive, make it worth our while. Red Lobster did and then some! We could have anything we were curious about, from mixed drinks to lobster or crab legs. They automatically brought out several appetizers for us to try, including the crab-stuffed mushrooms and the garlic shrimp — oh my, it was all delicious! All through the different courses and sampling, the hosts gently encouraged us to post photos to Instagram, which of course we did. The thing I really liked was the servers at Red Lobster felt like my grandmother worrying about me not eating enough. Not only did they keep bringing food, they insisted I take some home once I got too full! They packed enormous take-home bags for each of us. We get it, we really do. The reason we bloggers are invited is for a sales pitch; however, the way in which you do it makes a world of difference. Kelly, the GM, would stop by every once in a while and go over a few different items that were new on the menu. She was a very confident speaker, which is always good. And instead of one long sales pitch, we got it in small doses mixed in with our regular conversation. The wait staff was extremely knowledgeable and all responded to our questions well. For example, one of the bloggers is allergic to shell fish. The answer? An “allergy menu” was instantly brought out listing all the ingredients. (Who knew Red Lobster had such a thing?) As it turns out Red Lobster recognized there are quite a few diners who don’t like seafood, so their revamped menu has plenty of “land” items on it as well as vegetarians options. I cannot explain how many times I’ve gone to an event prepared to tweet and have no idea what the relevant links are! 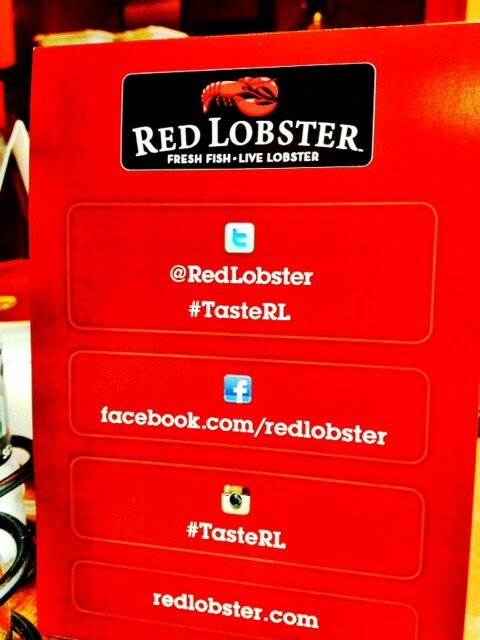 Red Lobster remedied this by having table top cards listing all the relevant links and hash tag for the night. This is an easy way to provide vital information! 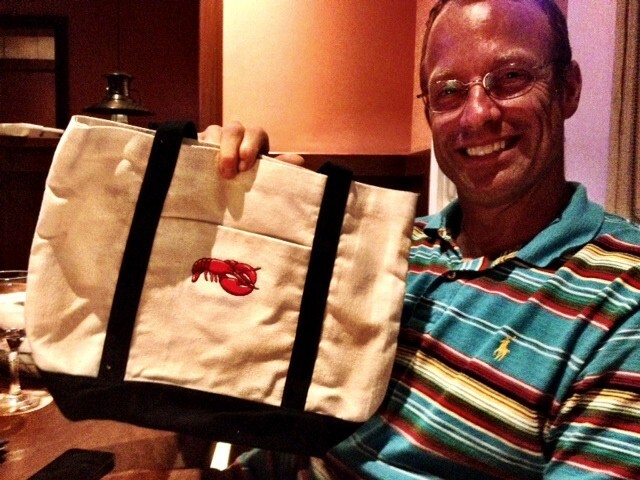 In addition to the take-home doggie bags, Red Lobster also prepared a special swag bag for each of us. Inside were menus for us to refer back to as well as gift card to be sure we would be coming back. Nice and appropriate! My hubby and I both enjoyed the night. We were in and out within two hours, and I appreciate Red Lobster respecting our time. Not only had we eaten way too much, we had really enjoyed the experience. So, thank you, Red Lobster, for creating a very positive night! Other restaurants, pay attention — they are doing things right! Remember, leading up to the November 1st launch of the new community I am creating specifically for marketers/PR reps and small business owners, I’ll be writing a series of posts here on Medium. I’ll continue discussing the reasons behind my new project as well as sharing tips that you as a marketer can utilize right away. I’ll also share case studies and show ways brands have gained a true ROI by working with online influencers. And remember, my new project is limited in availability: only 20 individuals for 6 months will have access to me and my knowledge and my database of over 1,800 bloggers and online influencers. So, until next time — and may your marketing be meaningful and your time well-used! Brought to you by the founder of FLBlogCon and the host of Blog Talk TV, a new project being built just for marketers.